This is something you don't see come up for sale much. A supposed 1 of 20 HKS High Deck RB26. Bid on it on eBay here - for the next 22 days. This auction is for a 2.8L HKS Hi-Deck block for the RB26DETT GTR. This is a fully assembled bottom end still in original crate and wrapping. It has only been opened once to take photos and check the condition. It has been properly stored and is in brand new condition. 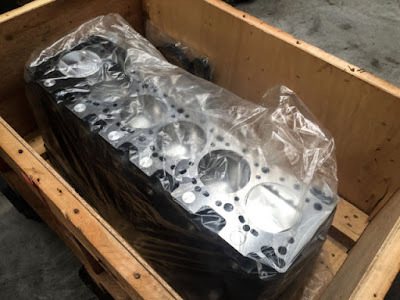 The HKS Hi-Deck crate motor has a HKS Racing Block, HKS forged pistons, HKS billet long stroke conrods, HKS billet crankshaft, HKS main and rod bearings, HKS spacer plate, etc. (All custom made) The block has been reinforced and had the water jackets filled. The block will work in any R32, R33, or R34 GTR running an RB26DETT as the blocks are interchangeable. These were produced in the early 2000’s after the success of the HKS R33 drag car, which ran a 7s 1/4 mile. The block is good for 1500hp and can rev to 13,000RPM. All other GTR’s that have run this motor have cracked 7 or 8s passes. These blocks are as rare as you can get in the GTR scene. Inside the crate is the official paperwork done by HKS.